As the 2018 midterm elections approach, women and especially college graduates have moved toward the Democratic Party. By contrast, the Republican Party’s advantage in leaned party identification among white voters without a college degree has never been greater, dating back more than two decades. While partisanship among voters usually does not change much on a yearly basis, some differences have widened over time, especially by educational attainment, gender and age. And these gaps are even larger when categories are combined, such as education, race and gender. A new analysis of party identification, based on more than 10,000 interviews of registered voters conducted by Pew Research Center in 2017, finds that 37% of registered voters identify as independents, 33% are Democrats and 26% are Republicans. Most independents lean toward one of the major parties; when their partisan leanings are taken into account, 50% of registered voters identify as Democrats or lean toward the Democratic Party, while 42% identify as Republicans or lean toward the GOP. While the overall balance of leaned party affiliation has not changed much in recent years, this is the first time since 2009 that as many as half of registered voters have affiliated with or leaned toward the Democratic Party. Since 2014, the last midterm election year, there have been notable changes in party identification among several groups of voters. And as we noted in our 2016 report on party affiliation, the composition of the Republican and Democratic electorates are less alike than at any point in the past quarter-century. Persistent gender gap. For decades, women have been more likely than men to identify as Democrats or lean Democratic. But today, a 56% majority of women identify as Democrats or lean Democratic, while 37% affiliate with or lean toward the GOP. The share of women identifying as Democrats or leaning Democratic is up 4 percentage points since 2015 and is at one of its highest points since 1992. Among men, there has been less recent change: 48% identify with the Republican Party or lean Republican, while 44% are Democrats or lean Democratic. That is comparable to the balance of leaned party identification since 2014. Record share of college graduates align with Democrats. Voters who have completed college make up a third of all registered voters. And a majority of all voters with at least a four-year college degree (58%) now identify as Democrats or lean Democratic, the highest share dating back to 1992. Just 36% affiliate with the Republican Party or lean toward the GOP. The much larger group of voters who do not have a four-year degree is more evenly divided in partisan affiliation. And voters with no college experience have been moving toward the GOP: 47% identify with or lean toward the Republican Party, up from 42% in 2014. Continued racial divisions in partisan identification. About half of white voters (51%) identify with the GOP or lean Republican, while 43% identify as Democrats or lean Democratic. These figures are little changed from recent years. By contrast, African American voters continue to affiliate with the Democratic Party or lean Democratic by an overwhelming margin (84% Democrat to 8% Republican). Hispanic voters align with the Democrats by greater than two-to-one (63% to 28%), while Asian American voters also largely identify as Democrats or lean Democratic (65% Democrat, 27% Republican). Larger differences among whites by education. Most white voters with at least a four-year college degree (53%) affiliate with the Democratic Party or lean Democratic; 42% identify as Republicans or lean Republican. As recently as two years ago, leaned partisan identification among white college graduates was split (47% Democrat, 47% Republican). Majorities of white voters with some college experience but who do not have a degree (55%) and those with no college experience (58%) continue to identify as Republicans or lean Republican. Millennials, especially Millennial women, tilt more Democratic. As noted in our recent report on generations and politics, Millennial voters are more likely than older generations to affiliate with the Democratic Party or lean Democratic. Nearly six-in-ten Millennials (59%) affiliate with the Democratic Party or lean Democratic, compared with about half of Gen Xers and Boomers (48% each) and 43% of voters in the Silent Generation. A growing majority of Millennial women (70%) affiliate with the Democratic Party or lean Democratic; four years ago, 56% of Millennial women did so. About half of Millennial men (49%) align with the Democratic Party, little changed in recent years. The gender gap in leaned party identification among Millennials is wider than among older generations. The nation’s changing demographics – and shifting patterns of partisan identification – have had a profound impact on the makeup of the Democratic and Republican electorates. Across several dimensions – race and ethnicity, education and religious affiliation – the profile of Democratic and Democratic-leaning registered voters has changed a great deal over the past two decades. The composition of Republican and Republican-leaning voters has shown less change. While a majority of voters (69%) are white non-Hispanics, nonwhite voters now make up an increasing share of all voters: 29% of registered voters are African American, Hispanic or Asian American or belong to another race, up from 16% in 1997. Nonwhites constitute nearly four-in-ten Democratic voters (39%), compared with 24% two decades ago. 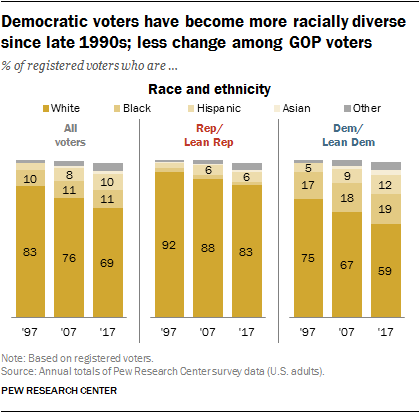 The GOP coalition also has become more racially and ethnically diverse, but nonwhites make up only 14% of Republican voters, up from 8% in 1997. The educational makeup of the two parties’ electorates also has changed substantially over the past two decades. When race and education are taken into account, white voters who do to not have a college degree make up a diminished share of Democratic registered voters. White voters who do not have a four-year degree now constitute just a third of Democratic voters, down from 56% two decades ago. By contrast, non-college white voters continue to make up a majority of Republican and Republican-leaning registered voters (59% now, 66% in 1997). The share of Democratic voters describing their political views as liberal has increased steadily since 2000. 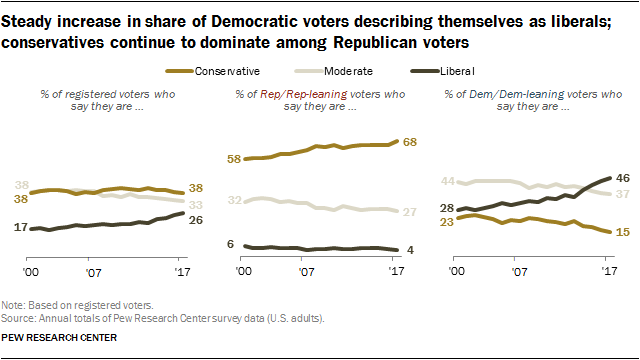 Republicans’ ideological views have changed little over past decade, but the share of Republicans identifying as conservatives rose between 2000 and 2008. Currently, nearly half of Democratic and Democratic-leaning registered voters (46%) say they are liberal, while 37% identify as moderates and 15% say they are conservatives. A decade ago, more Democrats described their views as moderate (44%) than liberal (28%), while 23% said they were conservative. Conservatives have long constituted the majority among Republican and Republican-leaning registered voters. Roughly two-thirds of Republicans (68%) characterize their views as conservative, while 27% are moderates and 4% are liberals. While there has been little change in Republicans’ self-described ideology in recent years, the share calling themselves conservatives rose from 58% in 2000 to 65% eight years later.